Click the button below to add the Level 3 - Modified Roadie Series ATA Case with Heavy Duty Hdwe to your wish list. The Level 3 Modified Roadie Series Custom Cases with Heavy Duty Hardware is a step up from our Level 2 Roadie Jr. Series. These cases are assembled with stiff 1/4" thick plywood, a firm gripping rubberized plastic laminate and heavy gauge aluminum extrusions riveted throughout. The Modified Roadie Series is finished with large recessed catches, handles and protective steel ball corners. Its inside boasts dense 3/4" foam lining, and the tray bottom and lids are filled with 1 1/2" foam. 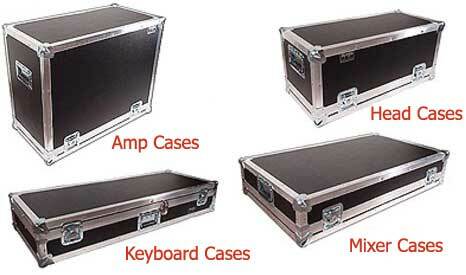 This road case is a great value for gig’ing musicians, as it is designed to keep gear safe and secure during transit. I'm a touring musician and I needed a new flight case for a guitar amp head. Ordering was really easy and the turnaround time of the order was very quick. The case is as solid as anything I've had previously. I highly recommend RoadCasesUSA. The case is well made and should stand up to just about anything. Not built exactly the way I imagined it for a small amp head, and was a hair too large (interior), but Christine sent me more foam and another handle so that I can "remodel" it to suit me. I have no complaints and the head is protected as well as everything I have in my Anvil and X-Case road cases. Competitive price and good customer service. It's a really nice case. Also, they were very specific about the measurements and called me to confirm my measurements. Excellent! Unbelievable case for the money! I am very satisfied with my purchase. I was a little reluctant because I had sent in the manufacturer's spec's and was worried that it might not be built right. When the case arrived I could believe how greatly packaged it was. WHen I opened the packaging I saw a beautifully made heavy duty ATA road case with great locking clasp and great protective corners. I couldn't wait to see how my fit. I grabbed my mixer and it fit perfectly. Unlike OJ's gloves! If you are thinking of buying a quality road case, I would highly recommend this company. And the shipping was free too!. I am a professional musician and member of AFM Local 655. I will be back when I need another custom case! I have a custom amp that needed some specific measurements. The folks at Road Cases USA nailed it. Everything fits snug and my amp feels super secure. Good prices and decent turn around too. This is my second time buying one of these cases. First for a peavey 6505 now for an engl invader. I have to say you will be pleased if you purchase one. The case is heavy duty but doesn't add too much weight once all loaded up. I'd recommend doing the different color options as well. This is the 9th case I've ordered from Road Cases USA. Excellent quality and workmanship, quick production and delivery. Excellent value for the money. I couldn't be more pleased. Level 4 - Airliner Series Amp Combo ATA Cases - 1/4" Or 3/8"